Managing files between multiple Windows Explorer windows is usually a hassle without a proper software to handle this task. Sure, it’s easy transferring a file or a set of files from one folder to another but what if you need to distribute them along multiple folders with different file structures? That’s quite a task especially since you have to either navigate to each location manually with your current window OR open a new Windows Explorer windows just for it. For tech-savvy users like you, I’m sure you’re looking for something to make this taxing task somewhat simpler. Windows Double Explorer offers a free and better solution than just sticking with plain old Windows Explorer. Windows Double Explorer (WDE for short) opens two panes, each with it’s own Windows Explorer window where users can browse and navigate files, folders, documents, etc. Two panes aren’t enough for you? Just add more tabs until you get your fill :D. I haven’t found out what the limit is on the number of tabs WDE can handle but I’m pretty certain it’s a lot. Now you might be wondering, what good does using Windows’ very own Explorer application instead of using it’s own dedicated file navigation system. 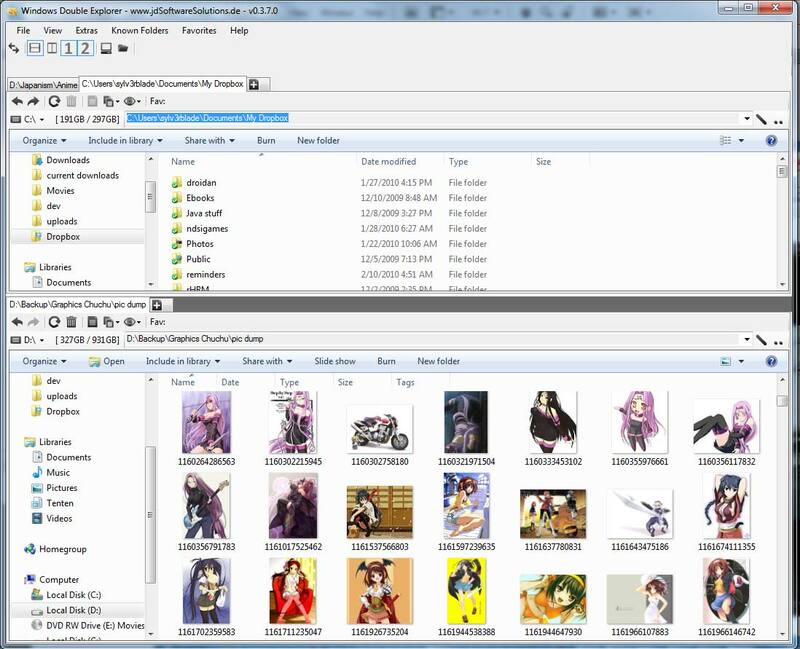 By using Windows Explorer, you get access to all the nifty additions that Windows 7 has added like Libraries, Favorites, etc. If you want something a bit more toned down and back to basics, you may want to look at the free version of Xplorer2 (Xplorer lite). My only qualm about WDE is that auxiliary mouse buttons (button 4 and 5 on my A4tech laser mouse) don’t work. They work gracefully with an ordinary Windows Explorer window for moving back and forth (button 4 is usually mapped to back and button 5 to forward) the directories you’re browsing and I kinda miss it while using WDE. I’m hoping it’ll be addressed with future releases :D.